raising funds for our future church home with a 24/7 presence. The Imagine MORE campaign is about creating our future church home — a place NOT just for us, but a home FOR people in this community to encounter God’s love. God is calling us to continue planting deep roots in this community. Our vision is to create a home with a 24/7 presence that is strategically located to minister to people and families in this area. A 24/7 physical presence will help us to reach more people more quickly, do even more ministry within this community, leave a legacy for generations to come, and see more lives changed forever because of Jesus. The Fountain has continued to grow every year since the church began, while at the same time, space in our current leased facility has become more limited. This campaign is about making room for new people and creating a ministry hub to better serve people in our community. As we are raising funds, we are actively searching and praying for God to show us the right land or facility opportunity. This campaign (phase 1) is a 3-year stewardship campaign that began on October 30, 2016. We invite you to Imagine MORE with us about all that God will accomplish through our future church home! 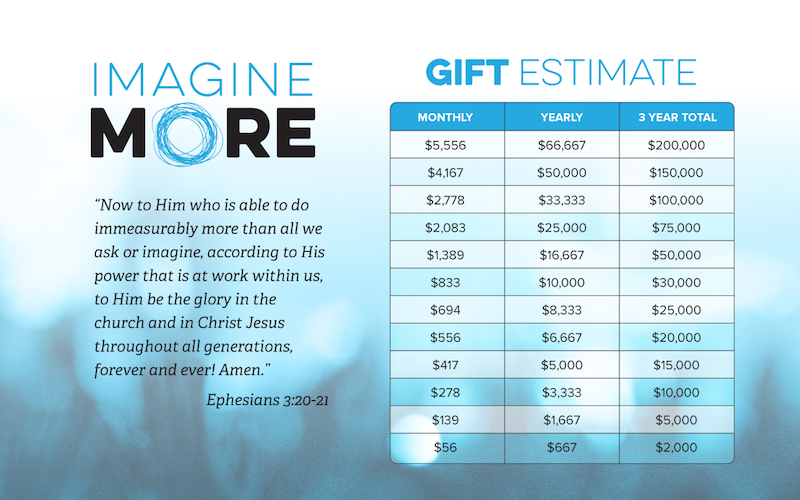 By pledging to the Imagine More Campaign you’ll be joining with other members of The Fountain to have an impact on this community. Use the card on the shown here to see typical commitments you could make over a 3 year period. To create a home with a 24/7 presence that is strategically located to minister to people and families in this area.